If you happened to be slightly alarmed by the local scenery on the roads a few weekends back, never fear! It was only us, moving the chicken coops. Sometimes these things just have to happen, and their timing is not in our hands. This… was one of those times. You will be relieved to know that the first load, which actually included live birds (all 26 of them), was driven by an experienced driver with a lot of years behind the wheel of a semi. 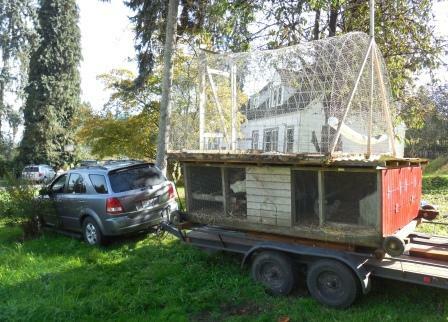 He did say this was the first time he’d ever hauled chickens. If you happened to be out on the roads when these were going by, I hope you were duly amused. The fun part being done, the guys then spent the next several hours outside – several of them after dark, with work lights – getting a temporary chicken yard set up for our newest residents. So here we are, complete with laying hens, two roosters, and our local neighborhood inspection crew! Although there are two roosters in residence, we haven’t seen them fight at all. This may be because one is the other’s father… or it may be that they both realize that with a harem of 24 girls, they both have all they can handle and then some. I think I may finally be getting used to having roosters go off at first light. A big thanks to Mrs. McC, who recommended silicon earplugs! 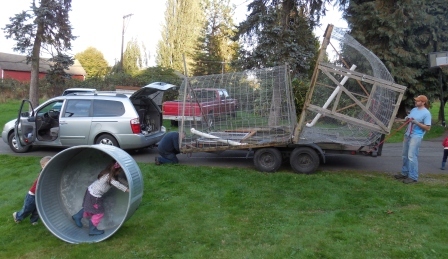 This entry was posted in Pastured Poultry, Projects, The Present Insanity and tagged chicken coop, chicken tractor, driving chickens, moving chickens. Bookmark the permalink.